The back bandage is used with the travel luggage case. 10+ Compartments offer a separated space for your Laptop, Mobile Phone, iPad, passport, pen, keys, wallet, watch, power bank, Ipod, 4A file, books, clothes, umbrella, bottle and more. Easy find what you want. Application: Multipurpose packs is perfect for business, trips, weekend getaways, office, college, school. PRACTICAL - A spacious ball net in front of the backpack,can hold basketball/volleyball/football/soccer/helmet or another things. DIMENSIONS for our SCHOOL & SPORT style DAYPACK - 35x 14 x 47 cm sport laptop backpack applies to computers up to 17 inches as well as 15.6 inch, 15 Inch,14 Inch and 13 Inch. 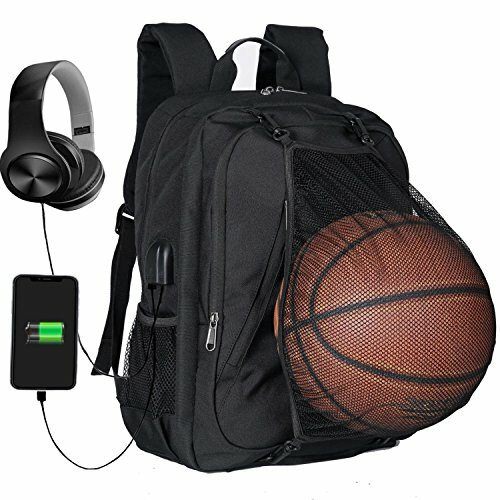 USB PORT DESIGN: With built in USB charger outside and built in charging cable inside,this usb backpack offers you a more convenient way to charge your phone while walking. Please noted that the power bank isn't available, usb charging port only offers an easy access to charge. Lightweight Slim Backpack for daily, school, work and business trip. It is made of durable and eco-friendly water-repellent oxford fabric. The shoulder straps and back side comes with padded design, easy and comfortable to carry throughout all day. If you have any questions about this product by XQXA, contact us by completing and submitting the form below. If you are looking for a specif part number, please include it with your message.